1. I'd like express my gratitude to who ever nominated me as one of the Top 25 Kid Bloggers at Circle of Moms! I'm truly honored, and I would be even more honored if you all would head on over there, find my name, and vote for Secret Doors before July 22nd! 2. this past week I had my FINAL therapy session. can you believe it? I can't. it's been two, almost 3, years since I started going to the same therapist, and now I'm moving into a "new season" of my life (as she would say). 3. any advice for a rising senior taking a jab a scholarship applications? I have been planning to utilize my unoccupied summer days by writing essays and filling out forms, but I can't seem to find the motivation or the wherewithal to write! help a sistah out! I need some good pointers on essay writing that will help my papers stand out and catch an eye. 4. I died when I saw these babies. 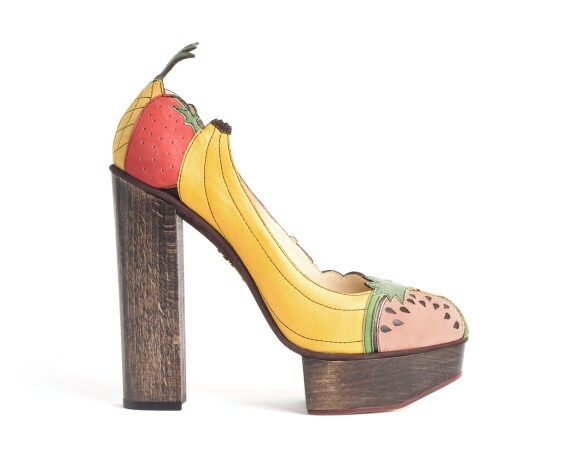 Charlotte Olympia "Bananas Is My Business"
the absolute perfect shoe for an avid fruit lover like myself. what are four things that have happened to you recently? those shoes are just TOO GREAT! I LOOOOVE them! oh how stunning would they be with a simple black dress?! and ONE thing that happened to me was i was just in miami for fashion week swim!